James 2:12 (NLT); so whatever you say or whatever you do, remember that you will be judged by the law that sets you free. The gospel is not one dimensional; it is multi-dimensional. This is why the Word of God is called the Law of Liberty. The Living Bible (TLB) version calls it the Law of free men. It means that our freedom in Christ is so that we function in all the dimensions of the Spirit. For example, there is no such thing as a calling to teach about prosperity only, healing only or healthy families only. There is more to the gospel than focusing on only one area of the scriptures. You may teach a man to be rich and yet he is dying with disease. You may teach a woman to make wealth and yet her marriage is breaking. You may heal a man and he remains poor. This does not mean that it is wrong to teach about wealth and money. However, don’t stop there; there is more to the gospel than that. Christ is our pattern. He was not one dimensional but multidimensional in his teachings. This ought to be reflected not merely in the lives of ministers but believers too. He taught about money, submission to spiritual authority, power and miracles, the person of the Holy Spirit, the mysteries of the kingdom, the power of Faith, the Word and its inherent work in us. Christ healed but He did not make healing His entire ministry. He prophesied but He did not make prophecy His entire ministry. He taught on finances but He did not make this the sum total of His ministry. He operated in the broadness of the Word and so should you, child of God. Christ healed but did not make healing His entire ministry. He prophesied but He did not make prophecy His entire ministry. He taught on finances but He did not make this the sum total of His ministry. 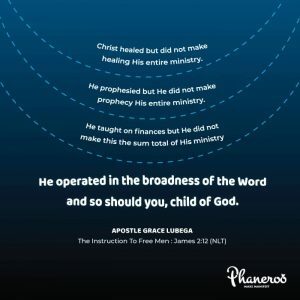 He operated in the broadness of the Word and so should you, child of God. PRAYER: My God, I thank You for this timeless truth. I carry a clear understanding of Your instruction to free men. I decree and declare that I am above limitations. You said greater works shall I do. If You taught, I teach more. If You healed, I heal more. If you prophesied, I prophecy more. To the glory of Your name. Amen.